This guide is intended to provide a comprehensive description of the encounter with Warlord Zon'ozz in Dragon Soul. It is targeted at anyone who desires to understand the fight mechanics. Warlord Zon'ozz is one of the two bosses that are unlocked after defeating Morchok, in the Dragon Soul raid. He is a Faceless One that your raid will face in one of two very similar Old God themed rooms, outside of Wyrmrest Temple. The encounter will require good awareness and teamwork from your raid, as well as strong healing, but it is not overly difficult. The Warlord Zon'ozz encounter has a 6-minute enrage timer in all difficulties. dispel a harmful magic debuff. The Black Phase, which lasts 30 seconds, is triggered whenever Zon'ozz is touched by the Ball (this removes his stacking self-buff). During this phase, the raid must stack together to deal with very heavy AoE damage. This alternation of phases continues until Warlord Zon'ozz is dead. 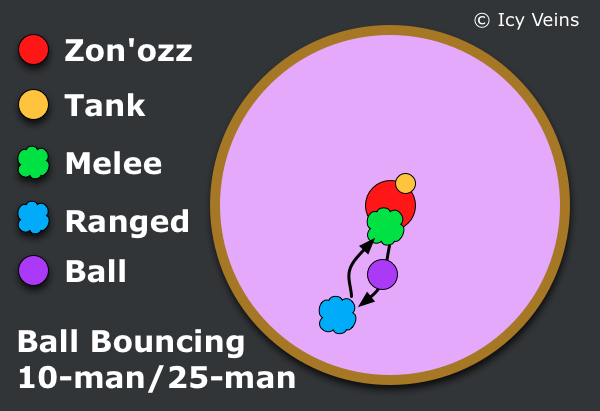 Also, each bounce that the ball makes during the Ping Pong Phase increases the damage that Zon'ozz takes by 5%, as explained in the next section. If your raid executes the fight properly, Zon'ozz will take increasing damage as the fight goes on. 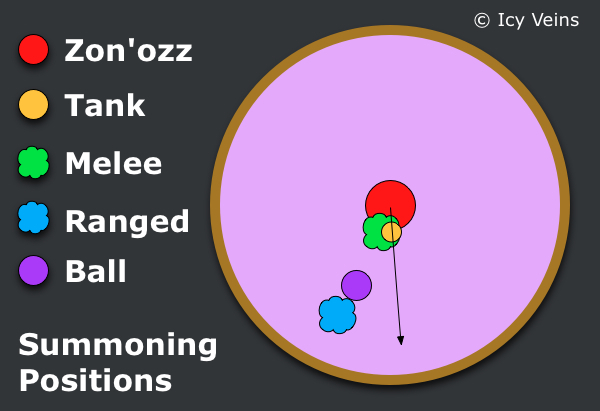 Indeed, every time you hit Zon'ozz with the Ball, each bounce the Ball made during the Ping Pong Phase will make him take 5% increased damage. For example, if the Ball bounced 7 times, Zon'ozz will take 35% increased damage. This debuff ( Void Diffusion) lasts 2 minutes. Therefore, if your raid does not let too much time elapse between each Black Phase, you can keep increasing the stacks of this debuff. For example, if the Ball bounced 7 times in the first Ping Pong Phase and 8 times during the second Ping Pong Phase, when the second Black Phase begins, Zon'ozz will have 15 stacks of the debuff and will take 75% increased damage. control the Ball so that it does not touch the walls of the room and so that it touches the boss at the correct time. The phase ends when the Ball touches the boss. Your raid will choose for this to happen after a certain amount of time, as this resets Zon'ozz' stacking enrage and makes him take increased damage for the rest of the fight. Focused Anger is a stacking buff that Zon'ozz applies to himself, roughly once every 6 seconds. It increases his attack speed and damage dealt by 10% per stack. Psychic Drain: a frontal cone attack that deals a high amount of Shadow damage (90,000 in LFR and 120,000 in 10 and 25-man difficulty) to every enemy in front Zon'ozz and heals the boss for 10 times the amount of damage dealt. Zon'ozz casts this ability every 20 seconds. Void of the Unmaking (which we refer to as the Ball) is an NPC that Zon'ozz summons at the start of the fight, and after each Black Phase. The boss will summon the Ball directly in front of him. It is immune to damage, and slowly moves around the room. a stacking buff that causes your raid to deal 5% increased damage per stack to Zon'ozz (the buff only becomes effective when the Ball comes in contact with Zon'ozz). If the Ball comes in contact with Zon'ozz, it forces him to enter the Black Phase, resetting his stacks of Focused Anger and causing him to take 5% increased damage for each stack of the aforementioned buff that the Ball had at the time. If the Ball comes in contact with one of the walls of the room, the entire raid is damaged by Black Blood Eruption. Disrupting Shadows is a DoT that Zon'ozz casts on a number of random players (3 in 10-man, between 7 and 10 in 25-man difficulty and LFR). This DoT deals Shadow damage (22,500 in LFR and 30,000 in 10 and 25-man difficulty) every 2 seconds for 20 seconds. Zon'ozz casts this ability every 20 seconds. It can be dispelled, and when dispelled, the target takes a moderate amount of Shadow damage (60,000 in 10-man and 70,000 in 25-man difficulty) and is knocked back. In LFR, dispelling the DoT has no negative effects. The strategy for the Ping Pong Phase revolves around bouncing the Ball (Void of the Unmaking) between raid members and then finally hitting Zon'ozz with it, in order to trigger the Black Phase (the more bounces before Zon'ozz is hit by the Ball, the more damage he will take for the rest of the fight). Disrupting Shadows must also be dispelled. Finally, players should simply deal as much damage as possible to Warlord Zon'ozz. In LFR difficulty, this aspect of the fight is practically irrelevant. The Ball is unable to ever touch the walls of the room (thus Black Blood Eruption is not a concern) and it will automatically hit the boss, triggering a Black Phase, when the boss reaches 11 stacks of Focused Anger. As a result, the Ball can be ignored in this difficulty setting. Even the damage from Void Diffusion is easy to deal with and should never cause any deaths. the visual effect of the Ball might not be obvious to melee players, especially since they will not be facing it, so they need to be very cautious not to move towards the ball when they move out to let the it hit the boss. With that in mind, the first thing to do is to deal with Zon'ozz summoning the Ball, something that happens a few seconds after the fight begins. The idea is to have the Ranged group stack about 20 yards from the boss and the Melee group (tank included) run to the boss. The exact positioning of the Melee group does not really matter at this stage, only that the tank must make the boss face slightly away from the Ranged group. The boss usually summons the Ball before the first Psychic Drain, but we have seen occurrences where the first Psychic Drain came before the Ball. So the raid needs to prepare for this possibility. This is the reason for making the boss face slightly away from the Ranged Group. When the ball is summoned, the Ranged group will have to move slightly, to intercept the Ball, while the tank should proceed to face the boss entirely away from them (due to Psychic Drain). The ping pong part begins as soon as the Ball collides with the Ranged group. Next, the bouncing will begin between the Ranged group and the Melee group. When it is time for the Black Phase to start (see section below), simply have all the players from the Melee group move out of the path of the Ball so that it can hit the boss. In LFR difficulty, it might be hard to get everyone from the melee group to move out from the Ball's path at the same time (so that it hits Zon'ozz). 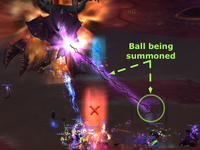 Fortunately, in LFR difficulty, the damage from the Ball touching a player is split over a very large area. This enables the tank to bounce the Ball alone (the damage will spread to the melee group, even if they are standing on the other side of the boss). When the time for the Black Phase comes, it is much easier to have only one player move away from the Ball's path (rather than a group of players). One important thing to keep in mind is that after he spawned a Ball, Zon'ozz will wait at least 90 seconds before spawning a new one. For example, if you spend 40 seconds in the first Ping Pong phase, you will need to wait 20 seconds in the second Ping Pong Phase before getting a new Ball (the duration of the Black Phase always being 30 seconds). The longer you wait before getting a new Ball, the less you can bounce it around before the damage on the tank from Focused Anger forces you to trigger a new Black Phase. Therefore, you need to spend approximately one minute in each Ping Pong Phase, so that you get a new Ball at the beginning of the following Ping Pong Phase. At the same time, you need to aim at bouncing the ball between 5 and 10 times, so that the damage from Void Diffusion remain manageable. Also, you do not want to remain more than 90 seconds in each Ping Pong Phase. Indeed, Void Diffusion, the debuff that keeps stacking on Zon'ozz at the beginning of each Black Phase (the number of stacks depends on the number of bounces of the Ball) lasts only two minutes. Spending more than 90 seconds in a Ping Pong Phase will cause the debuff to drop (adding the 30 seconds of the Black Phase to those 90 seconds makes it 2 minutes). 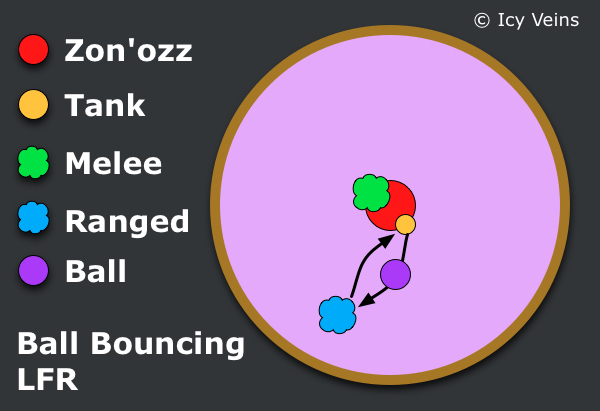 Note that, in LFR difficulty, the ball will automatically hit Zon'ozz after a few bounces (usually between 5 or 7). When dispelling, it is important that the player does not get knocked into the Ball (thus dying to unsoaked damage) or away from the group when the Ball is about to hit it (thus not soaking the damage, causing the rest of the group to take more damage). For these reasons, it is best to have one healer assigned to dispelling in 10-man, and one or two healers in 25-man, thus avoiding confusion. If the raid is topped off when Disrupting Shadows is cast, Priests can use Mass Dispel. In LFR difficulty, players should be dispelled immediately (minimising the damage that they take from the DoT), as there are no negative effects to being dispelled. After spending a period of time in the Ping Pong Phase, your raid will wish to trigger the Black Phase, by having the boss come in contact with the Ball (Void of the Unmaking). This will reset the boss' stacks of Focused Anger and cause him to take increased damage. This phase lasts for exactly 30 seconds, during which time your raid must only heal a large amount of raid-wide damage and DPS the boss. After 30 seconds, the Ping Pong Phase restarts. Black Blood of Go'rath: this is a debuff that Zon'ozz places on every raid member. It lasts for 30 seconds and deals Shadow damage every second (7,500 in LFR and 10,000 in 10 and 25-man difficulty). Zon'ozz spawns several Eyes of Go'rath. These NPCs cannot be tanked or attacked, and they deal damage to random raid members ( Shadow Gaze). From the moment Zon'ozz is hit by the Ball to approximately 15 seconds after Black Blood of Go'rath starts, Zon'ozz will not perform melee attacks. The strategy for the Black Phase is extremely simple. Just have your entire raid stack up on Warlord Zon'ozz and heal the damage. After exiting the Black Phase, Warlord Zon'ozz will, normally, first summon another Ball, and 5 seconds later he will start casting Psychic Drain. However, in case the previous Ping Pong Phase lasted less than one minute, the boss is likely to cast Psychic Drain before summoning the Ball. For this reason, it is advisable that the tank faces the boss at a 30 degree angle from the ranged group. As soon as the Ball has been summoned, the tank should face the boss completely away from the raid. DPS players will be able to deal the most damage to Zon'ozz (they are stationary for the entire Black Phase and Zon'ozz increased damage taken debuff will be at its maximum). Healers will have an easier time coping with the raid-wide damage. Minimise the amount of damage that the tank takes from Psychic Drain by pre-casting Power Word: Shield on him, or by having the tank use minor defensive cooldowns for Psychic Drain. Needless to say, no one other than the tank should ever be in front of Zon'ozz and thus hittable by Psychic Drain. 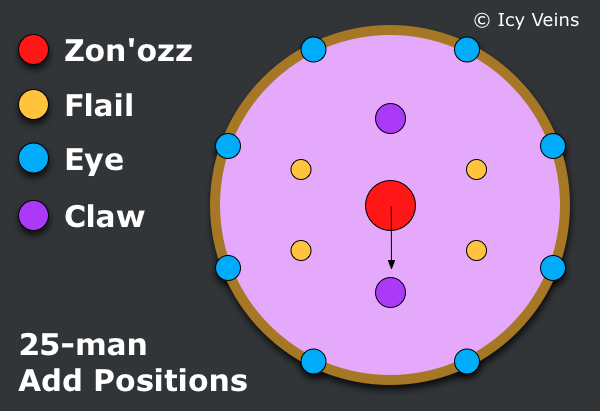 The most important thing to do when learning and practicing the Warlord Zon'ozz encounter is having the entire raid aware of their positions and managing the bounces of the Ball (Void of the Unmaking). By doing this proficiently and ensuring a good alternation between the Ping Pong Phase and the Black Phase, the encounter becomes almost trivial. The heroic mode of Warlord Zon'ozz is a very difficult encounter, with a high healing and DPS requirement. The Ping Pong Phase is almost identical to the normal mode version, while the Black Phase is significantly changed. The fight has a very strict enrage timer that will require your raid to optimise DPS and make use of certain tricks. Disrupting Shadows now deals higher damage than in normal mode, with every tick. When dispelled, however, it deals damage not only to the affected player, but also to all raid members within 10 yards, also knocking them back. Focused Anger now causes Zon'ozz to deal 20% extra damage (up from 10%) and attack 5% faster (down from 10%) with each stack. Claw of Go'rath is a large tentacle that must be tanked. If not tanked, this tentacle will deal massive amounts of damage to the raid, causing a fast wipe. 1 Claw spawns in 10-man difficulty and 2 spawn in 25-man difficulty. The Claw of Go'rath deals very low damage, and does not need a proper tank. Plate wearing DPS players and Feral Druids can perform this task. Flail of Go'rath is a small tentacle with little health. It deals damage to random raid members and performs a knockback on players within 15 yards of it. 2 Flails spawns in 10-man difficulty and 4 spawn in 25-man difficulty. Eye of Go'rath simply deals damage to random raid members. 5 Eyes spawn in 10-man difficulty and 8 spawn in 25-man difficulty. Additionally, Zon'ozz' abilities deal more damage, and he has more health. The Ping Pong Phase remains largely unchanged, with a small difference in how Disrupting Shadows should be handled. The Black Blood Phase is changed more considerably. We will cover all the important aspects below. During the Ping Pong Phase, the only important difference is that players affected by Disrupting Shadows can no longer be safely dispelled, unless they are far away from any other raid members. As a result, in most cases, the damage from DoT must simply be healed through. The Black Blood of Go'rath debuff that exists in normal mode works slightly differently. In heroic mode, this debuff gains stacks, and deals damage to the raid based on the amount of stacks it has (around 4,000 Shadow damage per second per stack). Each tentacle that is alive (Claw, Flail and Eye) applies one stack of the debuff. Killing the tentacles is required in order to lessen the raid-wide damage. The strategy for this phase is very simple, although there are certain tricks you should employ in order to beat the very punishing hard enrage timer. The tentacles are killed quickly, in order to lessen the raid damage, starting with the Flails, as these have the lowest health, followed by the Eyes. Finally, the Claw of Go'rath should be killed. It is likely that several tentacles will still be alive after the Black Phase ends. In this case, simply have your ranged DPS players finish them off before switching back to Zon'ozz. Keep in mind that the Eyes of Go'rath can be interrupted when they are casting Shadow Gaze, thus reducing the raid damage. There is no cast bar for this spell, however, and you will have to interrupt blindly. There are a few things you can do to improve your raid's DPS. We will cover all of them in this section. Firstly, the boss will be in the same location as the Claw of Go'rath (or one of the two Claws, in 25-man difficulty), since the tank will have to move to the Claw and the boss will follow him. As such, classes that can do cleave or splash damage should take advantage of this situation, spreading their damage to Zon'ozz while attacking the Claw. In 25-man difficulty, the second Claw should be tanked by any plate-wearing DPS player or even a Feral Druid (in Bear Form). Because it does not melee hard, these players should have no problem surviving. This second Claw should be killed by ranged DPS players. Secondly, you should make sure that melee DPS players only attack the tentacles that are closest to the boss (Flails and Claw), while ranged DPS should work on the Eyes, which are typically farther away. This will reduce the travel times of melee DPS players, allowing for more up-time on Warlord Zon'ozz. Your raid will trigger a fourth Black Phase. In this case, the damage during this phase will be higher than ever before, as the tentacles that you have left alive will add additional stacks to the debuff. Your raid will continue burning Zon'ozz at this time, ignoring all of the tentacles. Your healers should expend all their mana and cooldowns to keep the raid alive. The Ping Pong Champion achievement is part of the Glory of the Dragon Soul Raider meta-achievement. It requires your raid to bounce the Ball at least 10 times before triggering a Black Phase. Just to clarify, the Ball touching the boss cannot be the 10th bounce, it must be at least the 11th. The achievement requires a large amount of healing, as the boss' stacks of Focused Anger as well as the damage from the Void Diffusion will put a great strain on your raid. You can utilise a trick to make this easier: have the entire raid stacked in melee range of the boss, and have certain players with specific abilities bounce the Ball from the location of the Ranged group. Mages with Cauterize and Shadow Priests with Dispersion are the only classes that are confirmed to be able to do this, although Cloak of Shadows may also work. This means that when the Ball touches the Melee group, the large amount of damage will be split between a much higher number of players. This concludes the strategy guide for Warlord Zon'ozz. Overall, this fight is not difficult (in normal mode), but it does present an interesting, new mechanic that has not really been used before and that may challenge raids trying to learn the encounter.